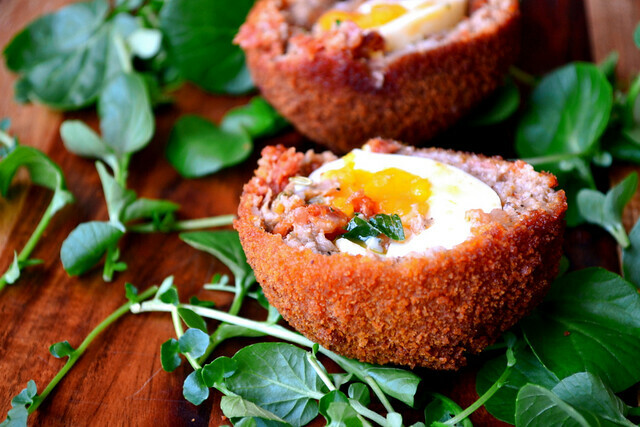 Scotch eggs have long been a favourite of mine; eaten eagerly with portions of chips in my youth. But as old age draws ever nearer, my desire for cheap and insipid scotch eggs has fallen by the wayside, replaced by a penchant for the delicious. 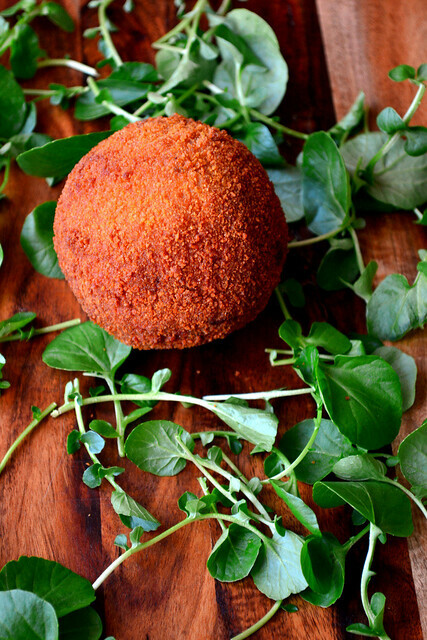 Homemade Chorizo and Fennel Scotch Eggs? They’ll do nicely. An egg, soft boiled and wrapped in a perfectly even coating of delicious pork meat and crisp breadcrumbs. Witchcraft. Scotch eggs had, before this weekend, daunted me. The reality? Ease, if not speed. They are the kind of snack or lunch that you assume is tricky; an unnecessary difficulty. Assumptions are unwise. Have a crack at your very own chorizo and fennel scotch eggs and you’ll realise just how easy they are too. When it comes to actually cooking your scotch eggs, the idea is to cook the meat just right, while leaving the soft, golden yolk untouched. Doing so makes for pure satisfaction, as you slice through the deep fried egg. And it couldn’t be further from the rattly cores of shop bought scotch eggs, almost emaciated in their appearance. Oh, and while we’re on the topic of satisfaction. The addition of fennel is perhaps the best thing about these fancy eggs. It is a spice that has always teamed up effectively with pork and things are no different where this recipe is concerned. Look for the little bursts of aniseed flavour; you’ll enjoy them immensely. Take 4 of your eggs and bring them to the boil. Cook for 5 minutes before plunging into iced water. Remove any skin from your chorizo and break it up with your fingers into a large mixing bowl. Add the sausage meat, fennel, paprika, salt, pepper and parsley. Mix thoroughly. Divide your meat mixture into quarters. Beat together the remaining eggs with a dash of milk in a bowl. Tip the flour into another and the breadcrumbs into a third. Between two sheets of floured cling film, roll out the meat a quarter at a time until large enough to engulf an egg. Before rolling out the next piece of meat, peel an egg, coat it in flour and place in the centre of the meat and cover neatly, pressing the meat around the egg firmly. Roll the meat covered egg in flour, then in the beaten egg, then in the breadcrumbs, followed by a second coating of egg and a final layer of breadcrumbs. Heat the oil in a large saucepan or wok until 170C (or until a breadcrumb fizzles when placed in). Fry the eggs 2 at a time for 7 minutes each, until golden brown. If they are browning too fast, remove from the heat, turn down and replace. Once cooked, drain on a paper towel, leave to cool slightly and serve. Scotch eggs will last for a couple of days, carefully wrapped in the fridge. Cost: Go to a local sandwich shop and order a scotch egg of this calibre and it’ll set you back a whopping £3.50. Give this recipe a go and each example will cost in the region of £1.25; a bargain, if a little more expensive than your average shop bought monstrosity. Me too – probably my favourite sausage. Love the softness of the yolks. You don’t really need one, just make sure it hot enough to cook briskly, but not so hot that it burns. You get a feel for it eventually. Is there a way to successfully prepare these without deep frying? Since I don’t deep fry often, I would not want to try and keep around a whole liter of used oil. But this looks so good, I might want to do it anyway. 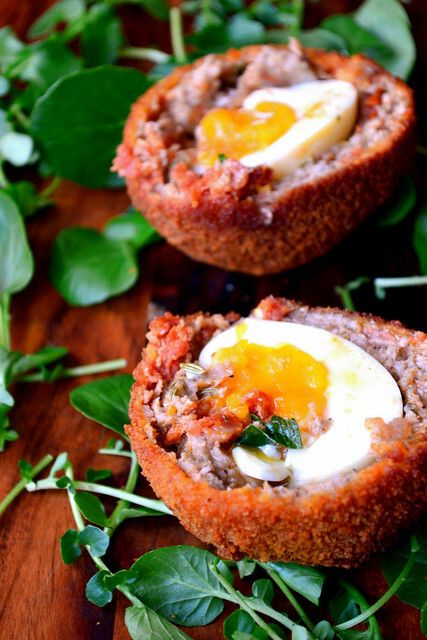 I’ve always wanted to try making veg scotch eggs–I’ve heard using squash and stuff can work pretty well. These look so good! I’ll be making vegetarian scotch eggs very, very soon. I can’t help myself. 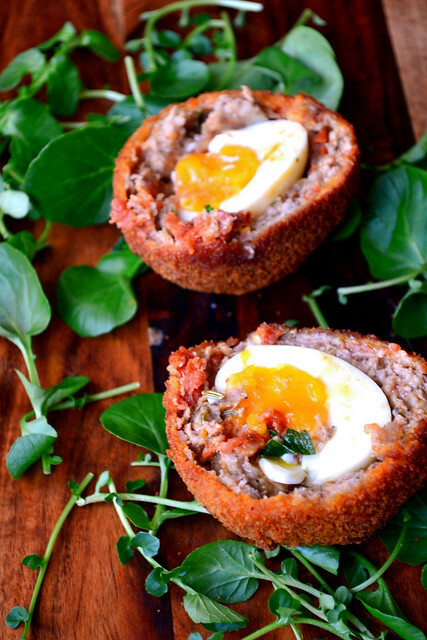 I am a relative newbie to the world of scotch eggs – primarily because I used to have an aversion to egg yolk – but I love the sound of chorizo in them! Me too – but they’re simple. Shame about the aversion to egg yolk though. The chorizo worked very well. They look amazing, the colours are so vibrant, like they are just in front of me waiting to be eaten….I’m hungry now! Me too! I’d really like some more. Tell me about it – I want more!